Soft, homemade, gluten free bread fresh out of the oven. Stop settling for crumbly, tasteless bread! This bread is soft and has a wonderful flavor that is so close to regular bread. Whenever I talk to someone who is just starting to eat gluten free, the first question is always what to do for bread. Bread is such a staple, and it really is tough to find a good gluten free bread. I grew up on homemade bread so I was accustomed to smelling that irresistible aroma of fresh baked bread and waiting eagerly for it to cool so we could eat half the loaf. I have waited a loooong time to post a gluten free bread recipe because I wanted it to be really good. Something that is soft and bendable, has that slightly sweet and hearty homemade flavor, and is so good fresh out of the oven that you just can’t resist having an extra slice. Why is this the best gluten free bread recipe? I first developed this recipe over 5 years ago, and have continually tweaked it over the years to improve its taste and texture. The most recent change included using 1 whole egg instead of 3 egg whites, using butter instead of oil, and slightly reducing the yeast. These changes were made in order to replicate the recipe my husband’s grandma passed along to me, and he agrees that this bread tastes just like hers. Now that is a compliment. 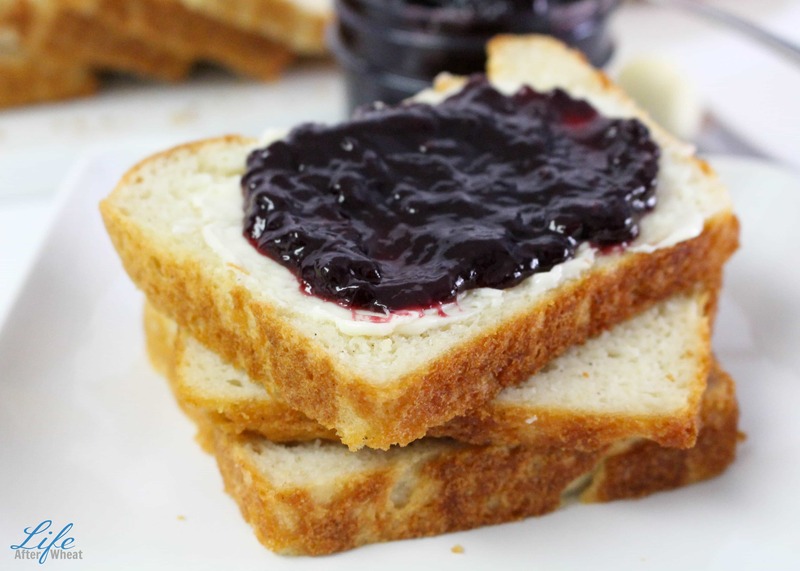 You can use this gluten free bread any way that you would normally use bread. makes great sandwiches, grilled cheese, and french toast! How do I store gluten free bread? 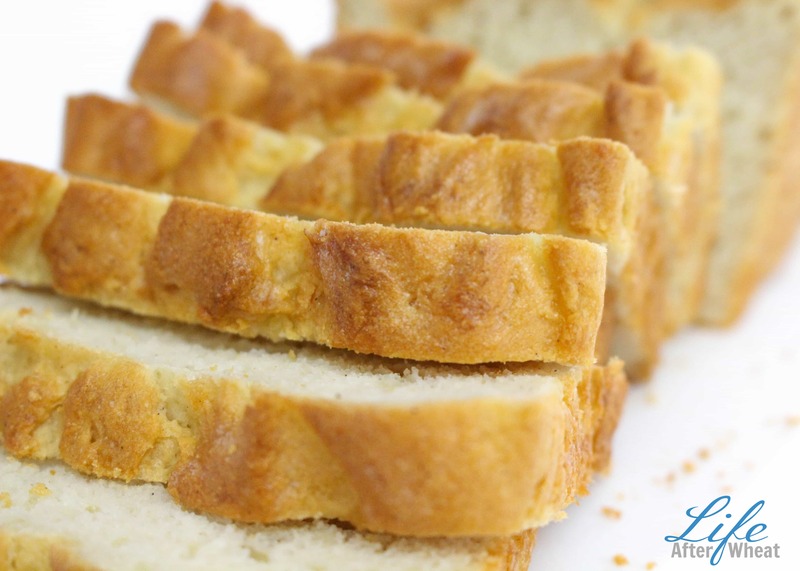 Like any gluten free product, this gluten free bread is best served fresh. Store whatever you won’t eat in a day or two in the freezer. You can slice it, place pieces of wax paper between slices, and seal in a gallon size freezer bag. Be sure to press all the excess air out. When you are ready for a slice of bread, pop it out of the freezer and into the toaster. Don’t store gluten free bread in the fridge, it gets crumbly very quickly this way. 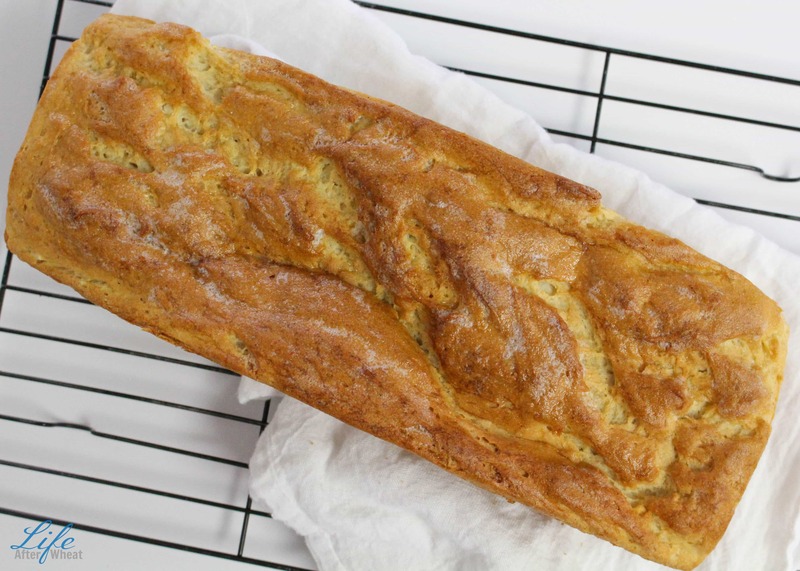 What is the best pan to use when making gluten free bread? I got from Amazon. The slices aren’t overly big which helps the gluten free bread stay together, and it’s simply a more convenient size for toast and sandwiches and such. It’s one of the best investments I’ve ever made. If you just want to use a pan you have on hand, that’s fine too! A regular 8×4 inch loaf pay will do the trick. What flour should I use in this gluten free bread recipe? I first developed this recipe using my flour mix. It’s very easy, less expensive, and more nutritious than many pre-made blends you would find at the store. The recipe includes 3 different batch sizes and if you use the small batch it’s just the right amount for this recipe. 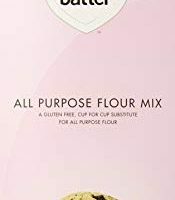 I make a point of testing all the gluten free recipes on this site with a variety of gluten free flours so that I can share what has worked and what hasn’t. No point in you having to go out and buy a different kind of flour if you can use something you have on hand and achieve the same results. 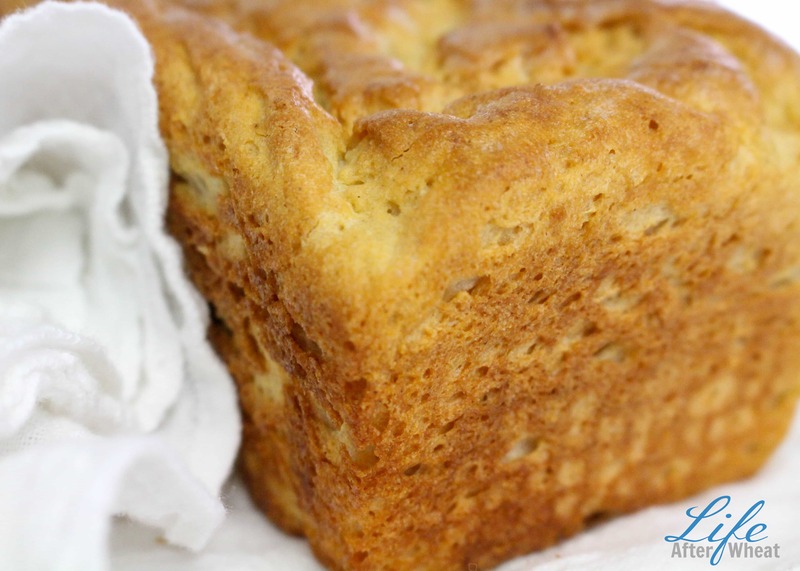 When making this gluten free bread recipe, I like to use gf Jules or Better Batter. OK, that all sounds great, but how do I make gluten free bread??? 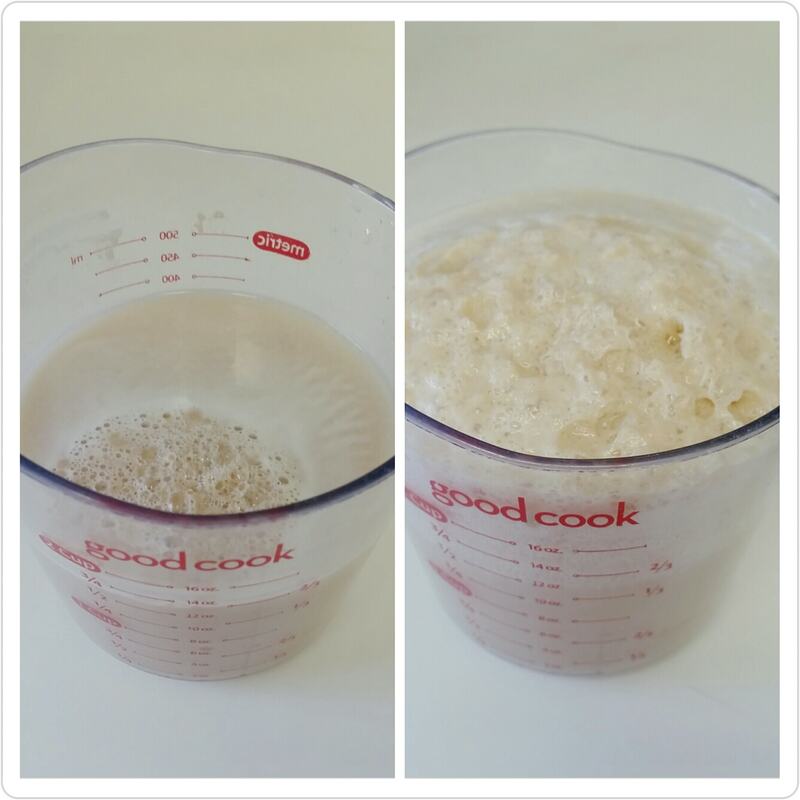 Proof the yeast by combining with warm water and sugar. If your water is too hot, it will kill the yeast. Too cold, and the yeast won’t activate. Don’t stress though, there is quite a wide range. I test the water on my wrist and if it feels a little warmer than room temp, and pleasant, it’s good (if you want to use a candy thermometer to check the temperature, it should be somewhere between 95° and 115° F). Stir until thoroughly combined, and let sit. I’ve found that putting the yeast mixture in the microwave (don’t turn it on!) and closing the door helps it proof faster. I use a 2 cup liquid measuring cup and add the yeast mixture to the dry ingredients when it’s almost risen to the top. After adding the proofed yeast mixture and all other ingredients to your mixing bowl, you’re ready to make some dough! (bread dough, that is) There are 2 important things to remember about gluten free yeast breads. The first is that you can’t over-mix. Gluten is what normally holds a dough together and provides elasticity. To compensate, we use xanthan gum to do the job of gluten, and it tends to work better if you really work it into the dough. Leave your mixer on for 3 minutes for best results. The second thing to remember is that you want your “dough” to be more of a batter consistency. It’s a little difficult to capture in a picture, but you can see that the dough is not thick enough to be shaped by hand, and is still quite sticky. Because your dough is very soft and sticky, you will want to shape it in the pan. No worries, it will (magically) turn out just like any yeast bread would. Be sure to grease your pan well because gluten free goods tend to stick a little more. Using a rubber spatula or wet hands, round the top. The dough rises quicker than your traditional bread. When rising, I turn my oven on until it reaches 90°, then turn it off and put in the loaf. It usually takes 20-30 minutes, and you’ll still need time to preheat your oven, so pull the loaf out when it is right at the top of your pan. Remove the pan from the oven while preheating, and then bake until a very golden brown. This bread is so very good fresh, our whole family loves it. 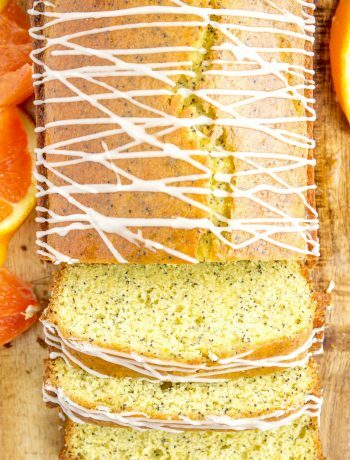 Can I make this gluten free bread dairy free as well? Absolutely! omit the powdered milk and use a dairy free butter substitute or a neutral-tasting oil. Can I make this recipe egg free? Yes. You can use a flax egg in place of the egg. The dough was too sticky so I added a lot of extra flour, and now the bread is crumbly and dry. What happened? Help! My bread dough didn’t rise. Make sure your yeast is fresh and at room temperature. Once you open a package of yeast, store in the fridge for 4 months, then replace. Be sure to bring it to room temp before baking! My loaf of gluten free bread looked AMAZING, and then it fell while cooling. Why did this happen? The bread tasted great, but had quite a few air pockets. Is this normal? If you mix the dough at too high of a speed, it will develop air pockets. Next time, try using a lower setting on your mixer. MAKING THIS RECIPE??? 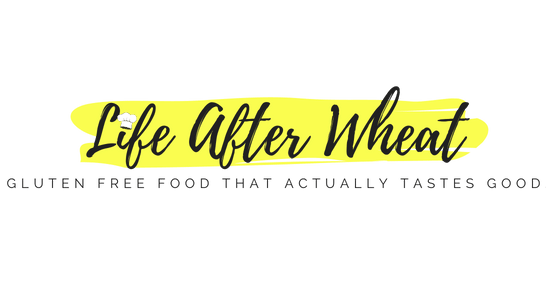 Snap a photo and tag @LifeAfterWheat on social media – we love seeing what you make! Measure flour by stirring the flour, scooping into measuring cup, and leveling with the flat end of a knife. Add flour mix, yeast, xanthan gum if needed, potato flakes, salt (add on opposite side of bowl as yeast), dry milk powder, and sugar or honey in bowl of stand mixer. 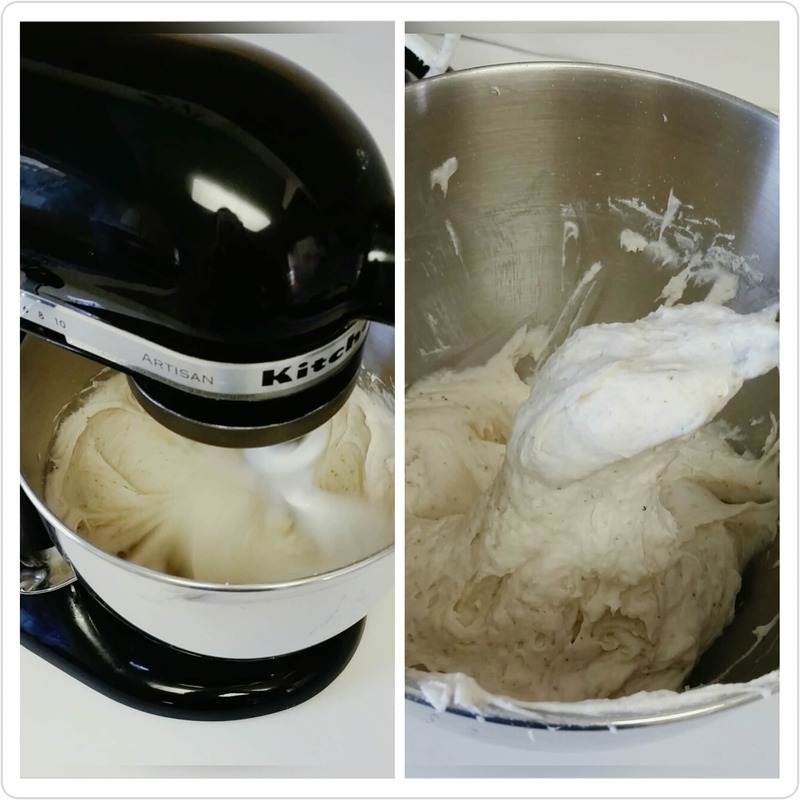 One of my readers makes this bread with a hand mixer and that works as well. Do not mix yet. Add vinegar, egg, water and butter. Mix on medium-low speed for 3-5 minutes. It should be the consistency of a thick and sticky batter, like a banana bread that has too much flour. Add additional water or flour 1 T at a time if needed to attain this consistency. Do not add more than 2-4 T of either one. You can refer to the photos in the post to see what the consistency should look like. Grease bottom and sides of 1 loaf pan. I find cooking spray works best, but you can use butter or oil. Spread batter in loaf pan, peaking the middle a bit lengthwise instead of spreading flat. Cover with plastic wrap or a light towel and let rise in warm place until loaf has almost doubled in size. I heat my oven to 110° and then turn off the oven and place loaf pan inside. It usually takes 20-30 minutes for batter to rise. Take bread pan out of oven and preheat to 350°. Bake for 40-50 minutes, until bread looks firm and is a nice deep golden brown on top. If you take it out too early, it will fall as it is cooling. Brush the top with butter. Let cool for 10 minutes in pan before removing to wire rack. Be sure to enjoy it fresh! It is best this way. The best way to store gluten free bread is to slice, place in a Ziploc freezer bag, remove all the air, seal, and freeze. You can then remove a slice and pop it in the toaster as you need. It might help to put pieces of wax or parchment paper between the slices so they don't stick together. Once you have frozen the bread, it's best toasted or warmed in the microwave for 10-15 seconds. I don't recommend refrigeration as the bread tends to crumble easily. Help! My bread dough didn't rise. Seems like an awful lot of gum. I have always heard just one teaspoon per cup of flour. You have more then that in your flour mix and then you say to add more in your bread recipe. Gaile you are right, 1 tsp gum per cup is the standard for yeast breads. My flour mix recipe uses just over 2/3 tsp per cup of flour, so the additional puts you at about 1 1/4 tsp gum per flour in this recipe. It’s what has worked for the texture we like but you are welcome to adjust to your own preference. Happy Baking! Sherry, using egg whites provides better lift and a lighter texture. Happy baking! What kind of yeast do you use? I thought instant yeast was gluten. 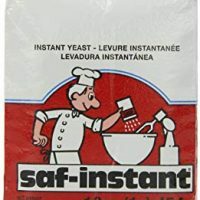 I use SAF instant yeast, which doesn’t contain any gluten. Thanks for stopping by! Does this work in bread machines? I have not tried this recipe in a bread machine, it’s so easy to mix up that I just haven’t bothered. If you try it, please let us know how it turns out! Thanks for stopping by! I’m so glad your family enjoys this recipe as much as ours does, thank you for taking the time to come back and leave a comment! 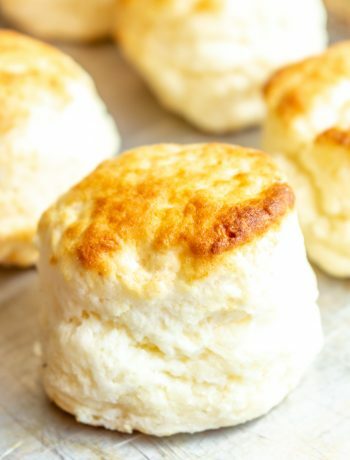 I bet your family would love our soda biscuit recipe, too, it’s one of our kids’ favorites. Vickie have you tried this with Pamela’s Artisan Blend All Purpose GA flour? This does not have xanthan in it. Just gar gum. I’m just wondering how much xanthan to add. What flour mox do you use? What flour mix do you use? If you’re looking for a pre-made flour, I would suggest GF Jules or Gluten Free Mama’s Almond Blend. Another reader used Pamela’s and said it turned out great! Just be sure to omit the xanthan if using Jules or Pamela’s because they already have some mixed in. Happy Baking! really want to limit or avoid rice and bean flours but then my bread falls apart and is too crumbly. I heard adding more tapioca flour helps but haven’t done it yet. I normally do use Pamela’s or Bob’s red mill but she uses rice flour…make the breads gummy and he likes the bean which is gross. The main problem with store bought is they use canola oils and too much sugar. I use olive oil and honey. I was excited to see this recipe until I saw that it uses egg whites. Is there some substitute? I am allergic. It’s been forever since I’ve gone near bread and I’m patiently awaiting someone’s suggestion. Thanks in advance! I bet it would work to use EnerG egg replacer, you would use 2 1/4 tsp EnerG egg replacer whisked into 3 T water as a substitute for the 3 eggs and be sure to use as soon as you prepare it. I hope you get to have some delicious bread soon! Thanks for stopping by. Thank you for the substititution suggestion. I will give it a try and let you know how it goes! An egg replacement is 1T ground flaxseed plus 3T water. To keep nutritional value of the flax seed, grind as needed. This adds fluffiness to pancakes vs. using eggs. Thanks for the tip, Lisa! Awesome, I’m gonna try that! Delicious bread and very easy to do! So glad you enjoyed it, thanks for stopping by! It’s a great recipe, thanks for stopping by! It does have xanthan in it already just like your flour mix does. You said it the ingredient list to add 1 and 1/2 tsp if there it’s already xanthan in it. I just wanted to double check to see if that’s what I do. Second, you can buy frozen bread dough in stores. You just put it in the pan to thaw and rise for 6 to 8 hours then bake. They do not do this for gluten free bread sadly. Could I freeze this dough like they do in stores? Then take it out to thaw/rise then bake? I would like to have a couple ready in the freezer to just pull out and bake. What are your thoughts? Would I just make the dough form it in a log then freeze it? Hi Amanda! I haven’t tried this flour mix, but the main ingredient is millet flour so the taste and texture will be different than mine. I’m actually not a huge fan of the taste or texture millet offers, but others love it so it’s just whatever your preference is. I’m also not sure if this particular flour is heavy or light on the xanthan, so you can add it and if it’s too spongy, omit it next time. Or, you can leave it out and add it next time if the bread is a little crumbly. I also haven’t tried freezing the dough and am hesitant to do so because it can be difficult to get gluten free dough to rise under different circumstances but, again, you’re welcome to try and I would love to hear how it goes for you! having dough in the freezer would be so convenient. Does that answer your questions? Thanks for stopping by! I cancelled my order for the flour on Amazon. I’m going to buy all the ingredients to make your flour blend. 🙂 I will try a loaf and if I like it I’m going to try to freeze the dough. I will just do 1 to freeze and let you know how it all turns out!! Sounds great, I can’t wait to hear how that works for you! What happened to the flour mix recipe, the link always comes up not found? So sorry Heather, it’s fixed now! You could bake up a couple loafs and freeze one whole. Where do you buy all the ingredients to make your flour blend? Is Amazon the cheapest? Also, do you have a recipe for hamburger buns?? I’m def trying a lot of your recipes. So glad I found this site!! Amanda I usually pick up bags of flour at my local natural foods store since it is close and I can get it anytime I want. If you plan ahead, Amazon can be a great resource! 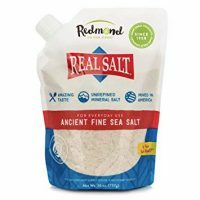 Authentic Foods has superfine flours which are sold on Amazon. As far as the hamburger buns, homemade are so tasty but we usually just keep Udi’s hamburger buns in the freezer, pull out and toast as needed. Gluten Free Mama has a great bun recipe you can find here (I’m drooling over the onion variation): http://www.glutenfreemama.com/2014/06/mamas-basic-hamburger-bun-recipe-with-4-html/ Happy Gluten Free baking! Now this one does use all the same ingredients you use in yout blend with a few differences. No Xanthan but has arrowroot starch, guar gum, and rice bran. I was reading through the questions people asked about the product. It was suggested to add xanthan per cup of flour for some things. Since this flour blend has the same Ingredients as your blend, would you suggest following what you said for your mix? Adding 1/2 tsp per cup if using yeast? But since there is no xanthan in it at all, would i always add it in? I’m totally new to doing gluten free baking on my own. So I have no idea what it means to add or take away stuff for better texture. I dont want to waste anythin either. I want to start making your bread every week instead of buying it. I have a friend who used Pamela’s and they seemed to like it. Guar gum has the same purpose as xanthan, so you can just add 1/4-1/2 tsp extra per cup of flour. If you’re trying to cut costs, guar gum is actually a little cheaper so that will help a bit! 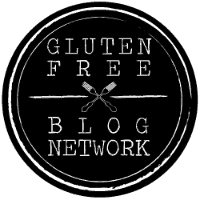 I had tons of questions when we began the gluten free adventure, so don’t ever feel bad asking! So I should add 1/4 to 1/2 tsp of xanthan per cup? I will save some money since I won’t need to use as much xanthan since there is guar gum already. I will try it first with 1/4 tsp per cup and if need be go to 1/2 tsp. Thanks so much for all your help!! I will be sure to let you know how it all turns out :). Another idea if you want to try her flour blend is to try your local bulk foods store so that you can buy just a cup or two of each type of flour. Bulk Barn in Canada and WinCo on the west coast have that option-maybe something near you will work? I’m always cautious with bulk bins because of cross contamination…it’s a great money saver just do so wisely! i just tryd it it is so good you haft to try it i love it it is so easy and neat it is so good i love it so much i love it be cause it is so easy and you will love it too and i no you will to. I am 7 years old and love cooking. So glad you like this bread, Ryland! Thanks for stopping by and keep cooking! When using the letter T for a measurement, are you referring to tsbp or tsp? Thanks! Tablespoon, sorry for the confusion! Love your egg substitution, thank you for sharing! The oil really does help the texture, I wouldn’t leave it out. Thanks for stopping by! Made this bread yesterday on a whim and it turned out brilliantly! 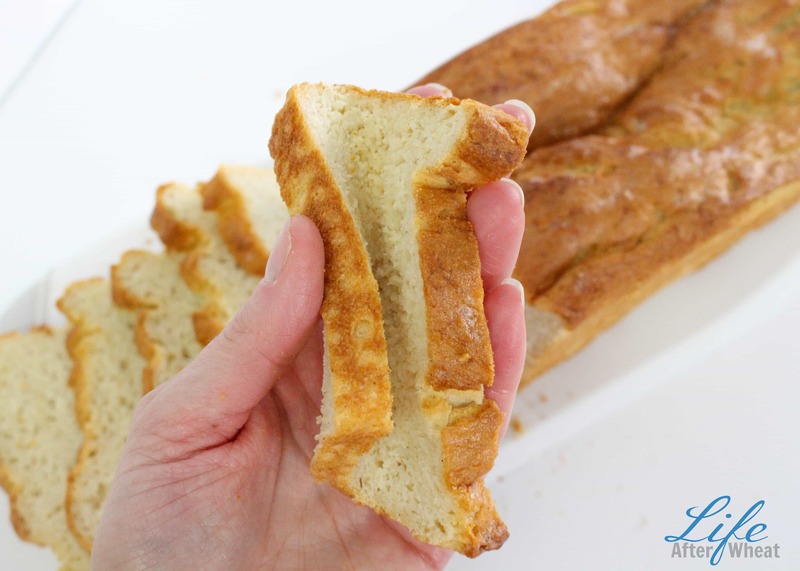 We have had so many different types of GF Bread since Celiac disease came into our lives– this one was a snap to make and super delish! Taste and tecture is just like regular bread! Toasted was a revelation!!!!! Make this bread folks and you’ll never feel deprived of regular bread again! Thanks a million from our family to yours!!! Thank you so much for the kind comments Marg, I’m so glad you love it, too! Hello!!! I finally am making this bread!! I’m going to try a loaf and if I like it experiment with freezing the dough like we talked about. The only problem is I already messed up :(. Remember how I asked how much xanthan to put in since the mix already has guar gum? I only did 1/4 tsp for the whole thing when it should have been 1/4 per cup of flour as you said. Man :(. There is a recipes on the Pamela’s website for white sandwich bread and they don’t add any xanthan, just use the flour blend as is since it has guar gum in it. I guess I will see how it turns out!! I was REALLY excited to try your bread!! I have yet to find a store bought one that isnt crumbly. I will keep you posted on the results. It is currently rising then I need to bake it!! I have a couple questions for you. Can you use coconut sugar in this or is white best. I want to use this bread for sandwiches this week. Do I have to store in the fridge or can I put it in an airtight container for the week? I bought the exact same yeast you use. A lot of people said they freeze it a n d it last for years. Do you freeze yours then take out to use as needed? 1/4 TSP xanthan per cup of flour is actually perfect, let me know if I said 1/4 cup somewhere and I’ll have to fix that! I’ve used regular white, rice, or apple cider vinegar and they all work great. I would stick to white sugar, but you’re welcome to experiment with other types 🙂 I keep in a bread bag on the counter for a few days, or slice and freeze with parchment paper between the slices so you can pull out and toast as needed. It’s definitely the best straight out of the oven though, enjoy! I only did 1/4 tsp xanthan total when I should have done 1 and 1/2 tsp because there is 3 cups of flour. I just put it on the cooling rack. It will be very short bread. I didn’t let it rise enough. This is my very first made from scratch homemade bread. So…..I will do better next time!!! Can’t wait to try some with my eggs in the morning! Do the different vinegars give the bread different flavors? Also…have you experienced some condensation on the bottom of the loaf when you remove it from the pan to put on the rack? Is that normal? I just hope the bottom of my loaf dries and it won’t be soggy. You will soon love making your own bread! you can turn your oven on until it reaches 100 degrees, then turn it off and put the bread in to rise, should be ready in 20-30 minutes that way! I haven’t noticed too much difference in flavor, though the apple cider does taste just a bit different. Once the bread has cooled it shouldn’t be moist on the bottom anymore. Alright I just cut off the end piece and gave the bread a try. Very soft but almost gummy too. Do you think it could be too gummy cuz I added xanthan when it already had guar gum? Or does that mean I need to add more xanthan? Like I said before I only put in 1/4 tsp instead of the 1 and 1/2 tsp. Please give suggestions for my next loaf :). Xanthan will make it more gummy because that’s what makes it stick together. I would leave it out next time. There’s always a little trial and error with gluten free baking because every flour mix is different. So experiment until you find what you love and then you can stick with that 🙂 I sometimes have better luck using flour blends that don’t have xanthan or guar gum added so I can play with amounts and find what works best for each recipe. Happy Baking! I am working on it, stay tuned 🙂 I also remembered that your bread may turn out a little gummy if you didn’t bake it long enough. Mine gets fairly browned on top before it’s done and it’s usually 40 minutes, sometimes longer. Also, wait to slice until it’s fully cooled and that might help. I just added pictures and more detailed instructions tot he post, I know it’s a little late in coming but hope it helps and you soon have delicious bread straight out of the oven! Wanted to print out just the recipe —-not every single darn comment. So sorry, I am working on a new site that will have printable recipes, it should be done in about a month so stay tuned! Meanwhile, you can copy just the recipe section, paste into a Word document and print from there. Thank you for stopping by! Has anyone frozen this recipe with duccess? Katie we freeze the bread all the time, and just warm slices in the microwave or toaster as needed! Do you have a recipe for a chewy (not crunchy) gluten free pizza dough? Also for small buns like he burger buns with your home made gluten free four mix as I have mixed it and is ready to bake at home for my 9 year old daughter who is on a fodmap diet.she rather live witout bread after eating store bought GF breads. Now we r all on a fodmap diet! Yes! Search Pizza on the site and it will come right up-it’s amazing and you’ll love it! I haven’t developed a gluten free hamburger bun recipe yet, but Gluten Free Mama has a great one! Thanks for stopping by! I made this bread and it came out real hard and dense. didn’t rise at all. what did I do wrong? I’m so sorry Mimi, there are a number of things that could have caused this. In order to get a good rise, the yeast needs to proof with the water and sugar until it’s doubled in size, the dough needs to rise until it’s as tall as the pan, the dough needs to be a batter consistency per the instructions, and it also can depend on what flour you use. Heavier flours such as Bob’s Red Mill may not rise as well as a lighter blend. Does this help? Sandwich Bread | Food, Flavor & Fun! This bread is a great density, but WOW it’s yeasty! I had absolutely zero problems with it rising. If anything, I had to punch it down a bit after only 10 minutes letting it rise. I used your flour recipe. Do you think I could reduce it by half a tbsp and still get good results? I’ve never had it rise that quickly, Samantha. Maybe it’s an altitude difference or the dough was a little too wet. You are welcome to try reducing the yeast if you’d like! 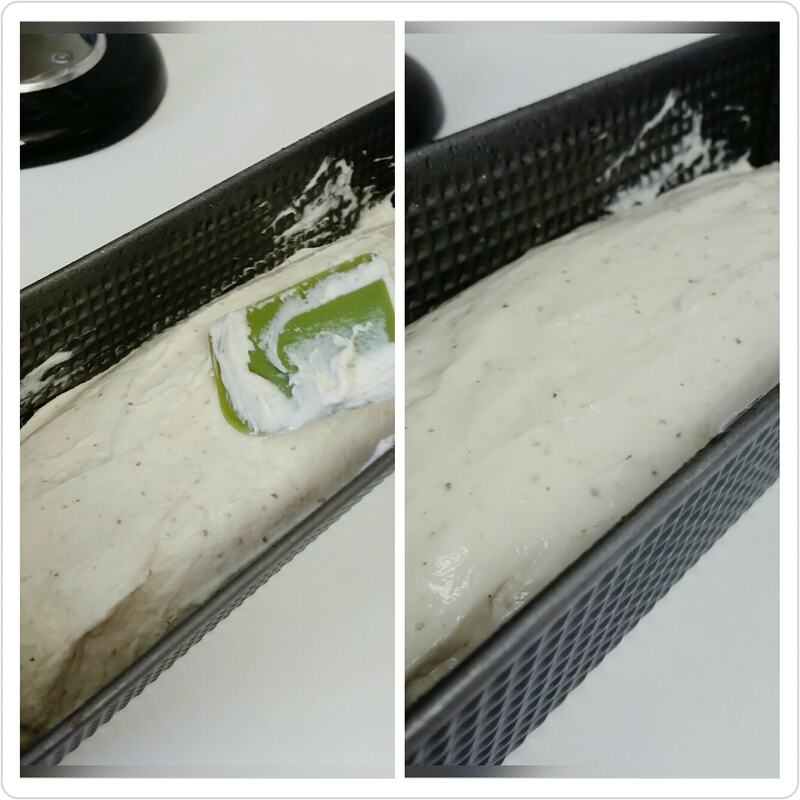 ive been trying a LOT of gkuten free bread recepies…and this one… is awesome!!! even my gratest critic (my son) likes it!! no more store-bought breads for me! So glad to hear that you and your son love it, Millie! Thanks for stopping by! Do you have to use INSTANT yeast? Hi Becky! All gluten free baked goods produce a better rise with instant yeast, so I recommend it. 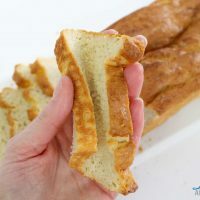 I’ve tried about 6 or 7 different gluten free bread recipes in search of a great sandwich bread and nothing compared to this one. This is my second time making this recipe and although it didn’t rise well the first time this bread tasted AMAZING! My second attempt was much better, it rose very well and I actually made two loaves at once and they turned out well. They are cooling as I type this. My husband who is gluten intolerant for over 20 years says this is the best gluten free bread he has ever tasted. I used your flour mix too and it seems to be the best gluten free flour combination I have tried. And I have tried A LOT of combinations. I have a gas oven and I’m not sure if this is the reason my first attempt didn’t rise well and the other recipes I had tried didn’t rise well either. This time I created steam in my oven by putting ice cubes on a hot cookie sheet on the bottom rack of my oven as the bread was rising. It helped a great deal. I had also warmed my oven to 200 degrees Celsius to create a warmer environment without ‘baking’ the bread. Thank you for an AWESOME recipe! I just took my two loaves out of the loaf pans and I had a lot of condensation on the the bottom of the pans and the loaves were a bit soggy. I read a previous post that this happened to someone else. I had lined my loaf pans with parchment paper. I find that it really helps from the loaves sticking to the pan. Should I NOT be using parchment paper? I turned the loaves upside down so the bottoms can dry out. So far they are drying well. I will wait until morning to cut them and see how they turned out. Hi Angela! 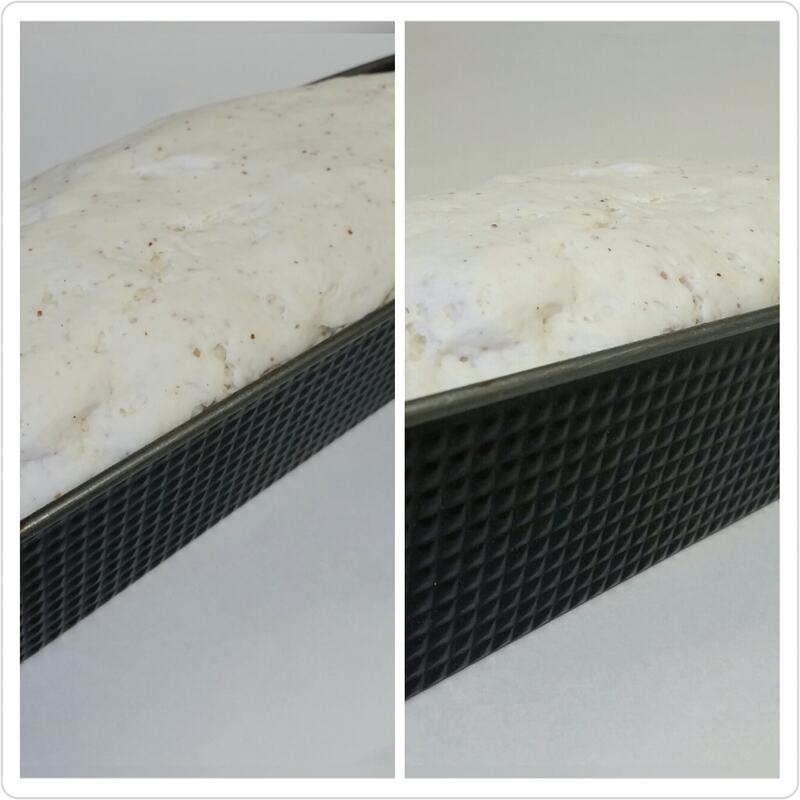 Moisture can accumulate if the bread is left too long in the pan. This can be avoided by removing the bread from the pan to a cooling rack after about 15 minutes. Thanks for the advice. Will remember to do that next time. As my bread cooled, it deflated a bit. Could it have been because it rose above the loaf pan rim? As soon as I saw them rise that much I baked them but I guess by that time it was too late. I’ll have to watch more carefully next time. Too much of a rise or not enough baking time can cause deflating. Also if the dough seems too wet that can cause a problem because it doesn’t have the structure needed to hold it up. Hope that helps! Yes, that helps a lot. Thanks for all your advice. Have you ever substituted applesauce for oil? I do it for the bread I make my kids and wondered if it would work here. I just went gf due to stomach issues and it’s helped me a ton. I also use honey for sugar, would that work here since it’s used in the proofing process? Thanks! Hi Courteney! Yes honey would work just fine, use it in the recipe just as you would sugar. I’m not sure about the applesauce, I’ve done that in quick breads but never in yeast products. If you give it a try, let us know how it turns out! Hope you find lots of recipes you love here! As I live in S A what flour mix can I use? Will 2 eggs in place of the 3 egg whites work in this recipe? In a pinch, yes. But the egg whites lend a much better texture/rise so I recommend using the full amount of egg whites. Thanks for stopping by! Thank you! Thank you! Thank you! I’ve been making this for a few months and it has made the lifestyle change actually enjoyable. I enjoyed the flavor of this bread. My daughters liked it but not as a sandwich bread. I was stuck again. I still needed a sandwich bread that they would eat. I tried just adding 1 T honey and that did the trick. They now have a gluten free bread for their sandwiches. This was our last obstacle. Thank you! So happy to hear this Michelle, thanks for letting me know! I am excited to try this bread! You mentioned that if the bread will not be eaten the same day, it should be put in the freezer. I am going to be using it to dip into fondue and I need to make it early. If I plan on making it and not eating it for a day will it be alright? A day should be fine, just leave it on the counter in a ziploc. I wouldn’t leave it for any longer than that though, and don’t refrigerate it as that will make it crumbly. Enjoy! Hi there! Wondering – I only have a standard 8″ loaf pan.. Has anyone ever tried it with that, or will it be just too much dough and cook wrong? Not sure if I should try it or cut the recipe by 1/3..
Hi Laura! Feel free to use the 8″ pan, just be sure your pan is filled no more than 2/3 full. If you have extra dough, you can make a mini loaf or shape it into rolls using wet hands or by putting it into a muffin tin. Enjoy! Reblogged this on Three Fates Fiber. I cannot use sorghum flour. Can you recommend an alternative? You can substitute brown rice flour. Enjoy! You mention heating your oven and then turning it off for the bread to rise, but you have 3 different temperatures within the content and comments: 90, 100, and 150. Could you clarify please? Thank you! I heat until the oven says 90, then turn it off. It continues to heat just a little so ends up being the perfect temperature. Thanks for asking! FYI… CANOLA IS AN INDUSTRIAL OIL AND GMO’D, AND IS DEADLY TO THE BODY! NO ONE CHECKS ON THESE OILS TO SEE WHAT AND WHERE THEY COME FROM! I WORKED IN A LARGE HEALTH FOOD STORE AND CUSTOMERS CAME IN ASKING ME WHY WE SOLD CANOLA OIL AND TELLING ME HOW BAD IT WAS. I DID MY HOMEWORK AND FOUND OUT THEY WERE RIGHT! Welcome to gluten free Kristi! Hope you find lots new favorites here. I haven’t tried Cup4Cup with this particular recipe, but it’s a high quality flour and I think it would work great. Please come back and let me know how it worked! This looks great!! Thanks for the updated notes too! Hope you try it, thanks for stopping by! It looks rather perfect to me! Although I definitely won’t be using eggs! It really is the perfect bread recipe, and readers have commented that you can substitute Ener-G egg replacer, so you can still enjoy it! I rarely make homemade bread, but I just may have to try this one. It looks great! It’s a keeper, Amanda! And the great thing is, gluten free bread is sooo easy to make. Looking forward to making this bread! What attachment do you use to mix the dough with? You mention whisking the dry ingredients but in the picture it looks like the paddle or is it the dough hook? Thanks! Great question Mel, I use the paddle attachment. Thank you! I really miss just being able to bite into a sandwich. You’re welcome Elle, enjoy some soft bread fresh out of the oven! Wow, this bread look so, so good! Pinning! Can the potato flakes be substituted for something else? I’m following the hypotoxic diet to treat my arthrosis and potato flakes/flour are to be avoided as they produce glycotoxins when heated at more than 110 degrees celsius (around 225 farenheit) which is bad for inflammatory diseases. Great question Nathalie, you can just go ahead and leave the potato flakes out, it will taste just about as good. Enjoy! Hi, I have made your original version several times and it was awesome! I just went to grab the recipe I had pinned and noticed you have changed it. I made the new version as written and while it rose beautifully on my counter, when I put it in the oven it fell flat 🙁 Could I please have the original recipe so I can write it down??? Hi Susan, I have a few ideas for you, let me know if you’ve tried them. First, which flour did you use? gluten free flours are so different that they can affect the finished product. Second, was the loaf a very golden brown? I don’t use a thermometer (I know, I know :)) but rely instead on the color for this recipe because it seems to take longer to bake than it would if you relied on temp. another suggestion is perhaps it rose too high before you baked it. Let me know if that helps! This bread looks delicious! I’ve been wanting to make my own loaf for a while and now I have no excuse to not…thanks for sharing. Thanks Christie, we make it all the time and even the gluten eaters in our house love it. Enjoy! I can’t wait to make this bread for my girls!! Thank you. I think you will all love it Chrystal, thanks! I already have powdered buttermilk for another recipe that calls for it…wondering if I could use that for the milk powder? Thanks!! 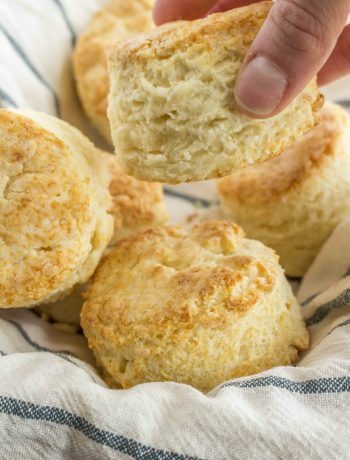 Powdered buttermilk is a little different than powdered milk, but I have made this recipe without and it works just fine. Just be aware that the flavor is a little more rich with the powdered milk 🙂 Happy Baking Kim! Thank you so much for your prompt response and your patience. I was able to find powdered milk at my local Wal-mart…it’s skim, fat free…is that ok or is the fat needed? All the ones I’ve seen are skim, so that should be perfect! I just made this and the batter was runny. I kept adding tapioca starch to thicken it. Also, it raised so much in the oven that it ended up spilling all over the bottle of my oven. What did I do wrong? I’m so sorry it didn’t work out! It sounds like there was too much liquid or not enough flour, which would cause it to be too thin and also rise too much. Humidity could also play a part in it. Do you mind me asking what flour you used? I did what you mentioned with half brown rice flour and half tapicoa flour, everything else I followed . The only thing I did was when it was mixing and it was runny, I added a little bit of tapicoa starch each time until it was thicker. The only thing I can think of Jen is that your humidity is quite higher. The flour mix I suggest making does have a little more flour than starch, so that might have been it? I hope you try it again, and if it’s too soft add more flour mix instead of just the tapioca which will thicken it more. I put the wet first, then the dry and sprinkled the yeast on top. Make sure your water is not too hot. It looks and tastes like white bread. What makes a bread cave in, in the middle? H. Should you whisk the egg whites before adding to the mix? I have tried this recipe two times now. Both times the bread rises but falls while still in the oven. I am not new to bread making but I can not figure out what I’m doing wrong. Any suggestions would be greatly appreciated. By the way love the taste of the bread but I always have about 1/2 inch on the bottom that is gummy. I have not taken it out earlier than the 35 minutes usually around 40-45. Hi! Is there anything to substitute for xantham or guar gum? I can’t do gums. Thanks! This looks amazing! I can’t wait to try it! It’s so hard to find a good gluten free bread that you can also make vegan! This looks INCREDIBLE! My husband is going to love it. Thanks for the recipe and all the pictures!